The bounce house combo combines the joy and happiness of a bounce house, with the thrilling sensation of an inflatable slide. 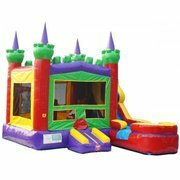 Some combo bounce houses also have pop ups and a basketball hoop inside making them a great inflatable rental option for kids of 8 years old and under. 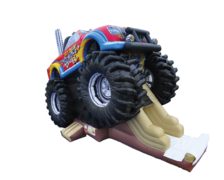 If your Inflatable bounce house combo is setup indoor, concrete, asphalt or require sandbags to secure the inflatable combo bounce house, there will be an additional fee to your rental.